That's the question quietly floating around the NBA. It was announced today by the Detroit Pistons that Allen Iverson will sit out the rest of the season due to his back problems. Many are suspicious because the team seems to play better without him. And since A.I. only has one year left on his contract, it's very doubtful that he would return to the Pistons next year where things aren't going too well. So where would he go? The Charlotte Bobcats have surfaced as a likely match. This move would reunite Iverson with Larry Brown, the coach with whom he had the most success. It would also give the Bobcats some much-needed star power, as well as an explosive scorer and floor leader. And since there's only one year left on Iverson's contract, it wouldn't cost the Bobcats too much should the move not work out. While the younger A.I. 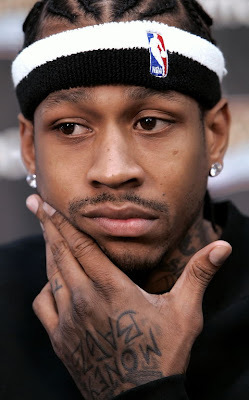 wouldn't have seemed like much of a fit for the Bobcats, today's 33-year-old Iverson could be. It'll be interesting to see what happens but nothing would transpire until this summer. The Bobcats still have to figure out what they're going to do with current team point guard Raymond Felton, who only has a year left on his contract as well. I envision a situation in which they embark on a three-team deal where they trade Felton and another player to a team, get Iverson from the Pistons, and the Pistons get a player or two from the team where Felton goes. This is all very possible, but regardless we can expect Larry Brown to continue to shake things up through trades. With him leading the Bobcats to their best season ever this year (and has them in the playoff hunt with the team selling out games), he's shown that he knows how to put together the right pieces. And I think Michael Jordan and Bob Johnson will give him anything he asks for. He just may ask for The Answer.